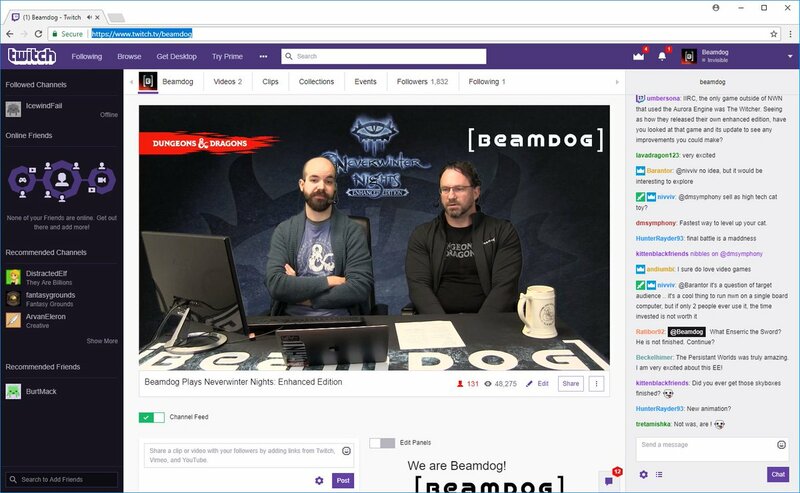 During today’s livestream Beamdog CEO Trent Oster and Studio Director Phillip Daigle discussed the latest Neverwinter Nights: Enhanced Edition news, explained recent updates to the NWN:EE Roadmap board, and tackled some really meaty modder questions. Between all that, Phil jumped on the Castle Defense persistent world server where he launched a few heavy loads from catapults a great distance. The latest Head Start update for Neverwinter Nights: Enhanced Edition Head Start is ready to download. The new v74.8155 build is about bug fixing, while we have a lot of big-factor features on investigation. Hop over to the full list of patch notes here. We’ve been updating the Roadmap Trello board. Cards for more portraits and making premium modules possible to play in multiplayer have been moved from the Input board to the Proposed column of the Roadmap board. Within the Roadmap board, we moved the card for Returning the original menu music back from Proposed to Active while also adding a new label - a “UI Refactor” label - to show the dependency between UI Refactor Investigation and other features which cannot be done unless we do the full UI refactor first. If you want to get involved into the development of Neverwinter Nights: Enhanced Edition - join the Head Start, have fun playing the game, share your suggestions on the forums, report bugs, and vote for your preferred feature requests on the Input board. There’s a lot for us to do while we are updating character models in NWN:EE and the Head Start (although it obviously will be called otherwise) will continue long after the release. We need player opinions about requests in the “Needs More Discussion” column. For example, there are currently 8 ideas about how to fix the Parry skill in NWN:EE expressed by the community. While we’ll definitely do something with this skill (in the same time keeping it not overpowered), it would help a lot if a consensus in the community could be reached. Right now our team, while considering the GUI update, is looking at third party frameworks we find promising. 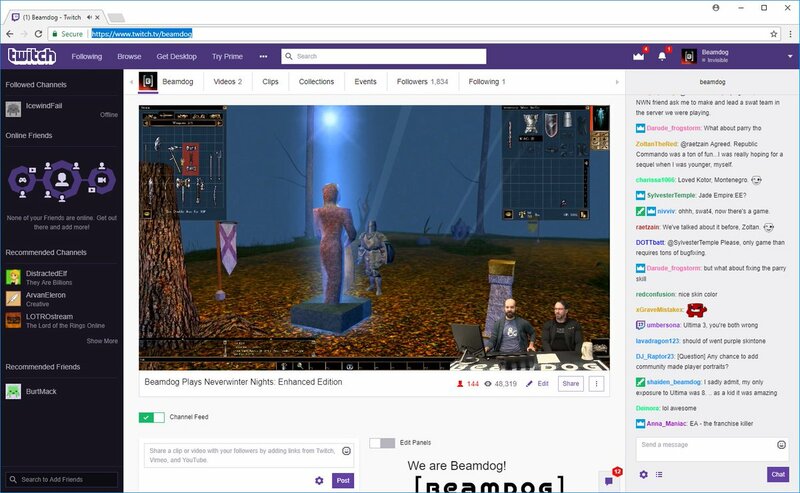 We investigated Chromium but found out it doesn’t offer the level of support we need for Neverwinter Nights: Enhanced Edition. There’s no easy solution to custom portraits being shown to all participants of the Multiplayer game in NWN:EE. There’re a few ways to approach this request which we’ll investigate. According to Phil, Baldur’s Gate: Enhanced Edition and Neverwinter Nights: Enhanced Edition would be a pretty natural fit for the Nintendo Switch. Phillip really likes this idea, but to be fair, he likes a lot of ideas! We don’t have anything to share about it at this time. Keep an eye on our career page here - we’ll be hiring soon. Most of our programmers work on C++ but what is more important is an ability to transition between programming languages. We want to stick with the role of being a curator for the Baldur’s Gate franchise, so there are no plans to officially support the Ascension mod for Baldur’s Gate II: Enhanced Edition. We’ll allow it to work - yes, but we won’t include it into the game. There may be a couple of features coming from Planescape: Torment: Enhanced Edition to Baldur’s Gate: Enhanced Edition, Baldur’s Gate II: Enhanced Edition and Icewind Dale: Enhanced Edition with the 2.5 patch. Stay tuned! I think (and Phil would probably agree with me on this one) BG:EE, NWN:EE, etc. will be a pretty natural fit for all modern consoles. As a common citizen, not code related: modern consoles practically pc in console case/box (x86), and unlike pc - just one set of hardware (per console). So, what in this equation may cause a problem? 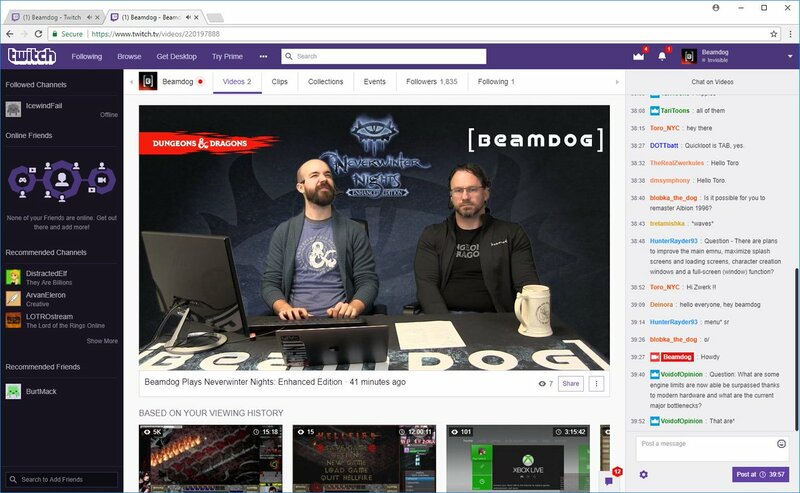 "According to Phil, Baldur’s Gate: Enhanced Edition and Neverwinter Nights: Enhanced Edition would be a pretty natural fit for the Nintendo Switch. Phillip really likes this idea, but to be fair, he likes a lot of ideas! We don’t have anything to share about it at this time."